While love is not a plant, it is funny how it flowers in spring and how summer and the sun feed it and make it prosper. There is no perfect relationship or anything like it, but there is much shared love and a strong desire to do things right. When both sides of the couple feel such great love, then the relationship can grow, advance and discover new horizons. If you have been lucky enough to find someone who makes you smile with just a look, a person who steals your breath and makes you see how beautiful it is to live, then you have had the joy of finding your soul mate and what you share is a unique bond of love, trust, respect and affection. It is important that you value the relationship and know how to cultivate it, in order for it to grow and prosper in the best way possible. No matter how much time passes in a relationship, it is always nice to receive a token of affection of our loved one, so today we bring you original sentences to share with your beloved husband on any given day, just because. :: “How was I supposed to not fall in love with you if you have the most beautiful eyes in the world? You are the craziest, maniacal and beautiful person I ever met in my life and I am just happy every day because I know we are together and that I get the pleasure of seeing you before anything else when I wake up in the morning. Thank you for your unconditional love, your wonderful support and your contagious happiness. I adore you, my love”. :: “I will never stop thanking life for having arranged for us to meet, because since you arrived everything changed for the better and I have never been so happy. Becoming your wife was the beginning of a joint life that has made me see that anything is possible when one truly loves. I adore you, love of my heart”. :: “Life has ups and downs, but when the person next to you has a lot of patience and love to give, then there is nothing that cannot be solved. I feel I am a very lucky person and having you makes me feel like I have simply won the lottery. I love you, cute hubby”. :: “Sometimes anxiety beats me and I see complications where there are none. If it were not for you, I think that it would happen much more often than it does already, because you make me see how easy everything can be when you think simply and without so much mess. Thank you for all you teach me, it is quite useful and it has turned me into a better person. I adore you”. :: “Waking up to your kisses makes me feel like I am in paradise, that I am still sleeping, that it is impossible that someone like me could have so much luck. Thanks, my life”. :: “I know that sometimes we fight and that things are not rosy, but I think the good times that we have are good enough to overshadow any bad moments that we may have. You give me the purest happiness I have ever experienced and marrying you was the best thing I could have ever done. Loving you is my all I ever want to do”. :: “When women get together, there are always complaints involved, that is a fact. However, when I get together with my girlfriends and I hear them complaining about their husbands, I stay silent, because I have nothing bad to say about you. That makes me feel very lucky and happy, because I was fortunate to marry my best friend, my better half. You are everything to me”. :: “Many people say that once you get married, the romance is over. You do not know the pride I feel in our relationship, because there is no day that passes by without us filling each other with details, words of kindness and love. Thanks for being you, I love you dearly”. Feel free to send a sentence as the ones we have presented and you will achieve to regain and continue to conquer your hubby’s heart. Good luck! When we have to make a decision as important as our wedding with our prince charming, many thoughts invade us that keep us from thinking clearly, but we must consider that we love him so much that we can only be happy with him by our side. Not all wives are lucky enough to feel loved more every day with the man she married. 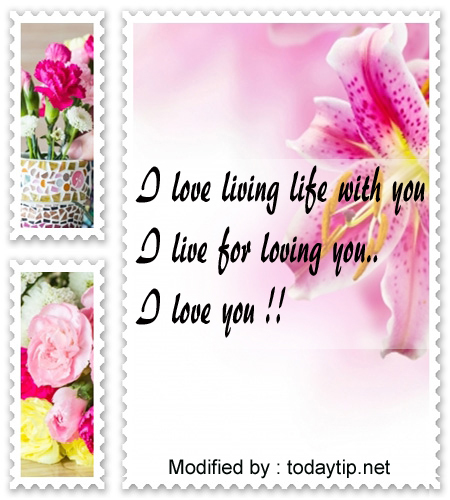 If you are one of those women and want a nice phrase to express your love to your husband you can send him a romantic greeting. If you want to say something nice, in this post you will find a list of affectionate greetings. Dedicate some of these phrases to the man of your life and make him happy, tell him how much you love him. You can send him these phrases by text message or post them on his wall in social networks. We hope that some of these posts have helped you express to your beloved husband the immense affection and gratitude that you feel for him. Come back for more greetings. Every time February approaches, many people tremble without knowing what to do, how to celebrate, who spend the evening with and what to get to their couple, if they are lucky enough to have one. Sometimes a detail says much more than an expensive gift, because it speaks of the love that the other person has for us and it shows us that they have been able to take a few minutes to do something special for us. Besides that, Valentine’s Day is coming and you still cannot think of what to get your husband. Do not allow yourself to be stressed; when you least expect it, something wonderful will pop in your mind and you will have your answer. Meanwhile, we recommend reading the phrases that we have brought to you, because they are full of affection and the best wishes for the day of love that you can share with him free of charge. It will be a nice way to accompany your gift and he will feel very happy to see how you have captured your feelings on lines that are meant for his eyes only. Check our proposal and remember the whole point of this day is to enjoy it, not being stressed. :: “Today we are celebrating the day of love and, with all the pride of the world, I can say that I lost count of how many we have celebrated together, because I feel like I have been with you forever. Nobody knows me like you do and I want to celebrate how happy we are. Our marriage makes me cheerful every day and I could not have made a better decision in my life; be by your side and wake up together every day is a dream come true. I love you, thank you for being you and I wish you a nice day, my love”. :: “When I open my eyes in the morning and I see you, I think I’m sleeping, because it is impossible that my reality is so close to my deepest desires. You manage to sleep in the most tender way I have ever seen and I can only think that I love you more than yesterday and less than tomorrow probably. Happy Valentine’s Day, my eternal love, my faithful companion, my adventurer, my ideal husband”. :: ” A love greater than the one I feel for you has not been created yet. I love you, I think of you, I feel you, I miss you, I want you, I need you and I love you again. I know that it may sound intense when you say it like that, but each of the words I write are coming out straight from my heart, traveling at the speed of light to reach the depths of your soul. Happy Valentine’s Day, sweetheart, you’re the best husband in the galaxy”. :: “Almost three decades ago we made the decision to walk together down the aisle. Nearly three decades in which I have been loving you more each day and I thank heaven for colliding our paths. You are a man of those who broke the mold, a man like no other. There is no woman as fortunate as I am, that is very clear to me. Let us hope to share the most beautiful of all days”. :: “I am deeply happy to be your wife. No one but you occupies my heart and I can only thank you for so many years of affection, cuddling, laughter and love. 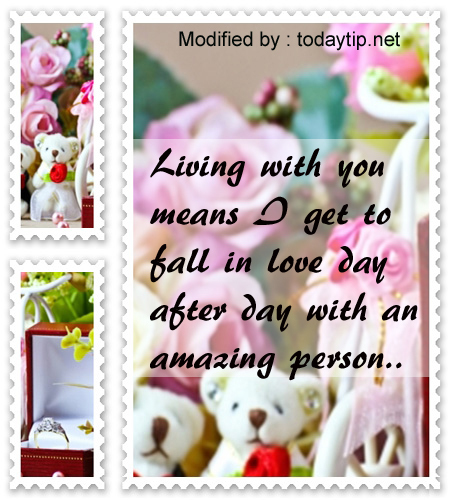 You are an amazing husband and I want to fill you with kisses and surprises. Happy Valentine’s Day sweetheart, XOXO”. Making the decision to become one in the eyes of God is not easy, is something that is built day by day and so we must work hard to achieve it. Send a phrase like the above to your husband, it is an excellent fertilizer for the relationship and, undoubtedly, will pull a sincere smile on his face. Dare to choose the one you like, customize it to your own style and share it with him. Come back whenever you wish, we will continue to update our site. Send your originals love messages for my husband , and will be published, others friends will thank you . The best and most accommodation facility for me is your Heart sweetheart,cos i pay no rent to be there.You are my one and only soulmate,my everlasting love,my comforter,my strength,my source of wisdom,my sweetpie,my only best friend,my teacher,my hero,my happiness,my lovely husband and the father of my children.I love you for as long as i live.I love you baby.